A sequence diagram is an interaction diagram that helps you visualize the interactions between objects in a system and the order of those interactions. The sequence diagram templates listed below will help you instantly start drawing them using our online diagramming tool. If you just want to use them as examples, you can download them for free as well. Just make sure to give proper credit if you’re using them in your articles etc. So let’s get started with the templates. 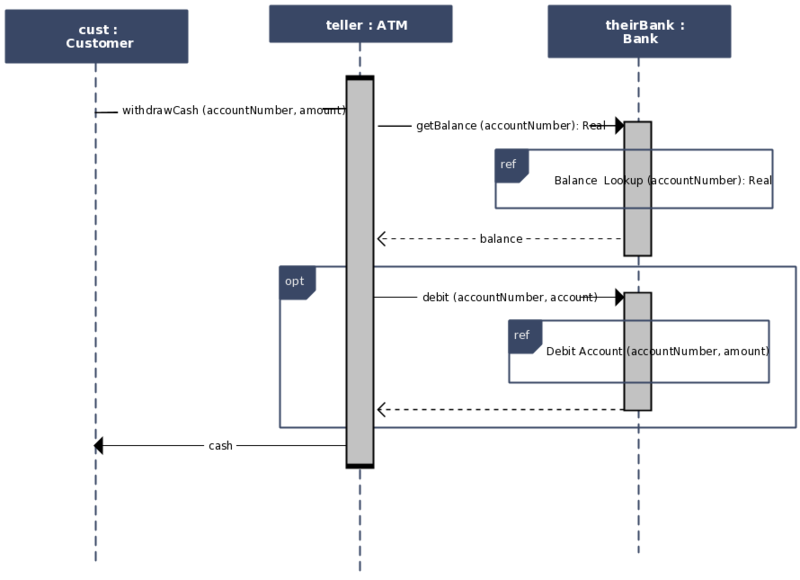 The sequence diagram template shows the various interactions found in an ATM machine. 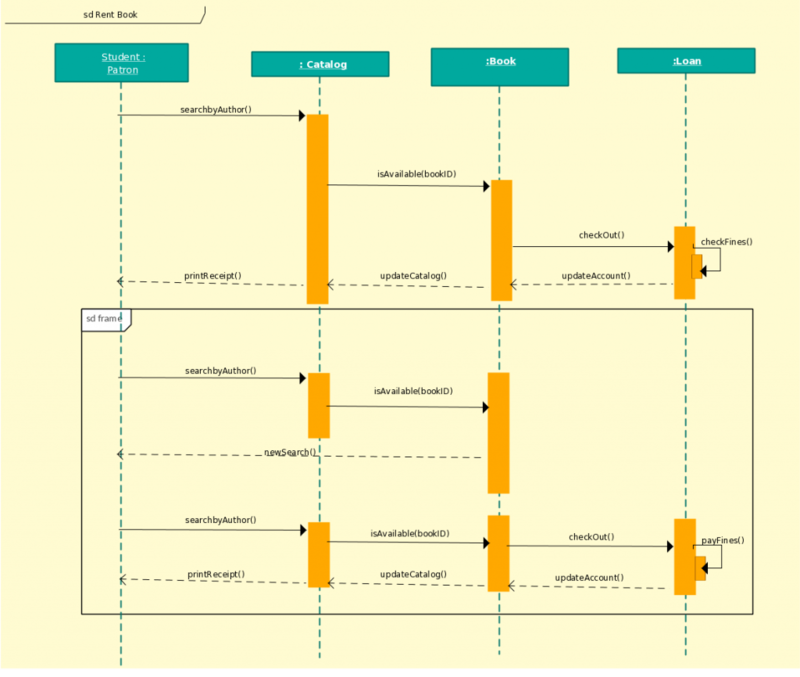 Different colors for entities and timelines make it easier to visualize the processes and their execution. 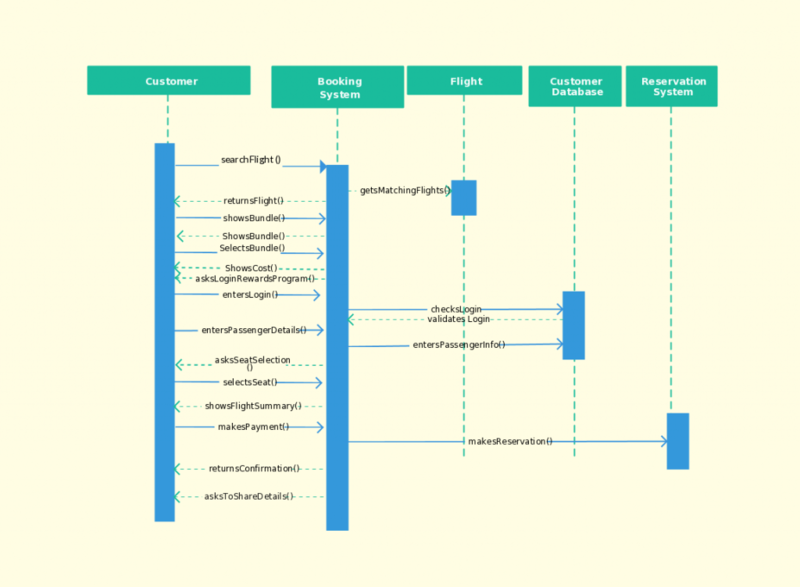 The sequence diagram for an airline booking system includes more main objects than the previous diagram. This diagram also makes use of colors to make it more clear and visually pleasing. Just click on the image to modify it online. 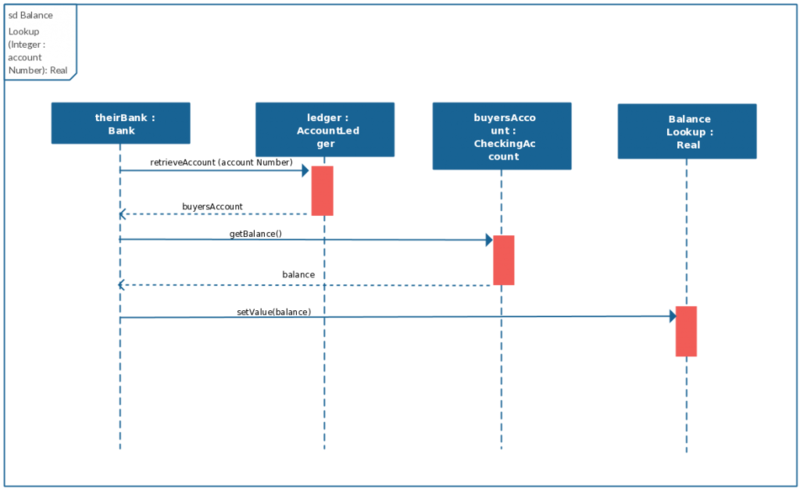 This sequence diagram template shows the various messages passed between objects during a fund transfer. A good place to start if you want to draw a sequence diagram of a bank system or a financial institution. 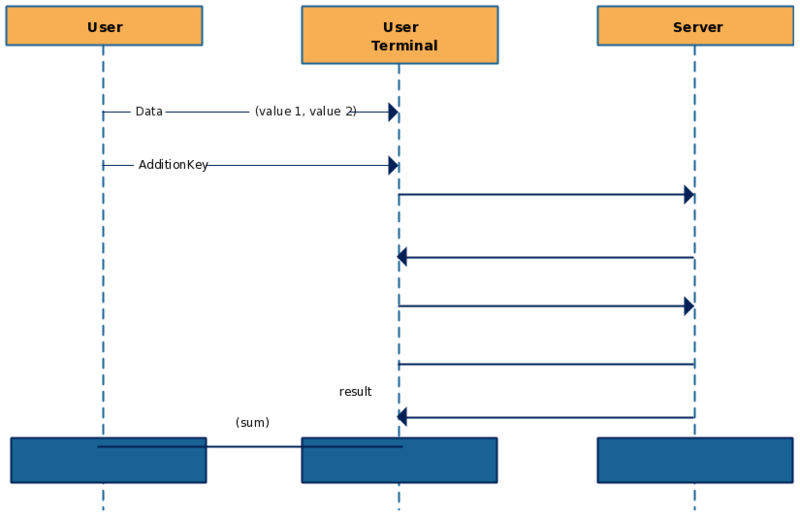 A sequence diagram template for a bus booking system. With a few modifications, you can use it for a taxi reservation system, rent a car system, bus ticket reservation system etc. Just click on the image to instantly modify to fit your system. 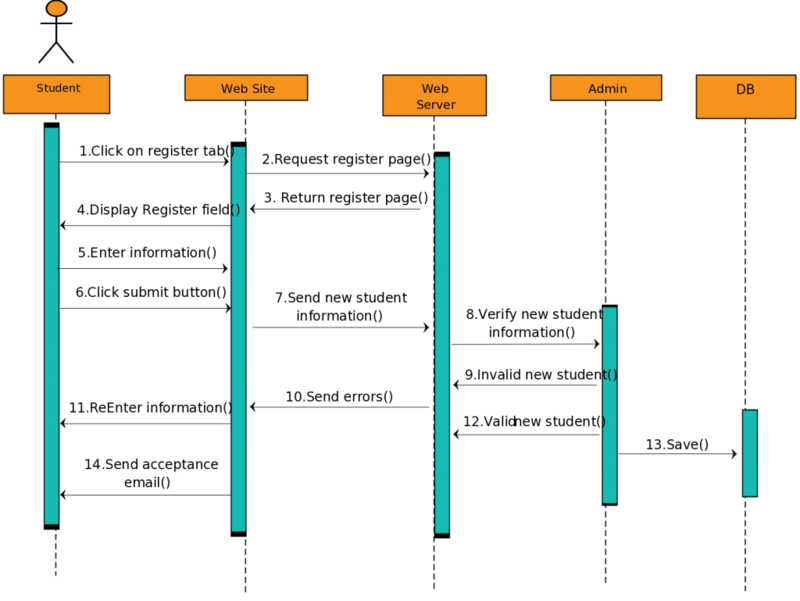 A basic system of a library management created using sequence diagram template. You can use a different color combination to make it more professional and clear. Click on the image to use it as a template. A sequence diagram template to create a hospital management system. Click on the image to modify the diagram to reflect your hospital system. 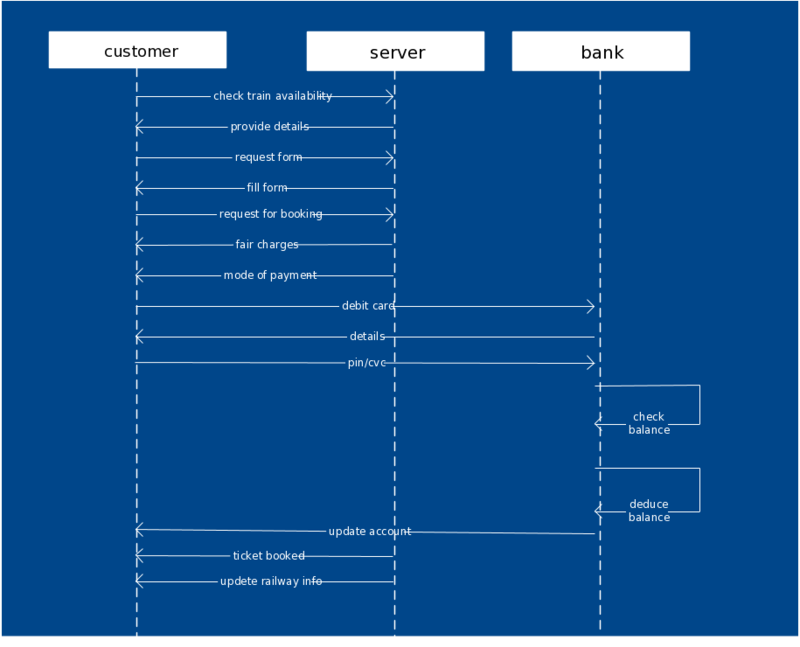 A sequence diagram template for a railway reservation system. Click on the image to create your own system as per your need. This student registration system template has numbered the process flow. This hasn’t been used in the previous sequence diagram templates. However, if you see it’s appropriate to number the flow, you can go ahead with that. Click on the image to modify it as per your requirement. 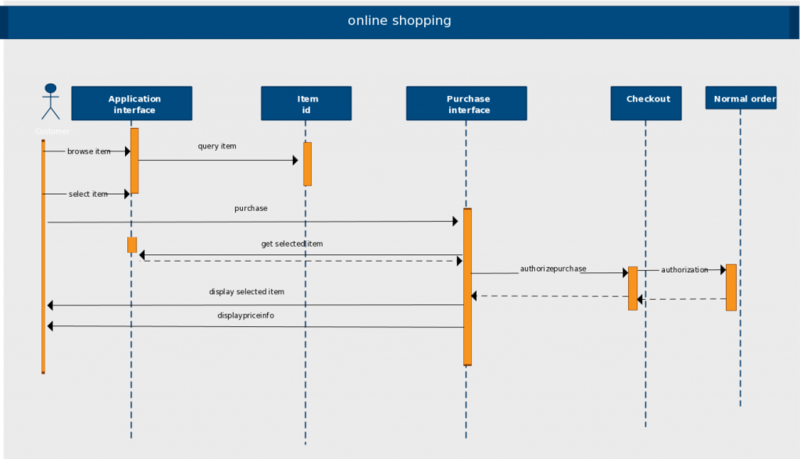 If you want to know how an Online shopping system works, here is a sequence diagram that explains the process for you. The system shows a breakdown of 5 different steps in online shopping. You can click on the image to add or remove steps as you see fit. 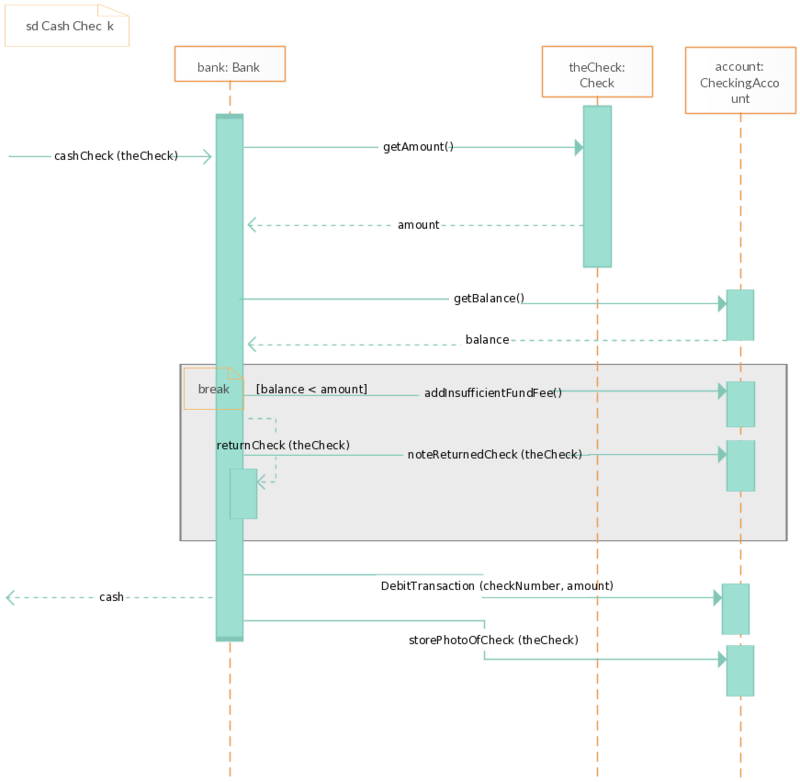 The following sequence diagram template represents the interactions between objects of an online movie ticket booking system. Numbering the process flow of a sequence diagram which shows several interactions between objects like the one below, adds more clarity to the diagram. Click on the image to make changes per your requirements. 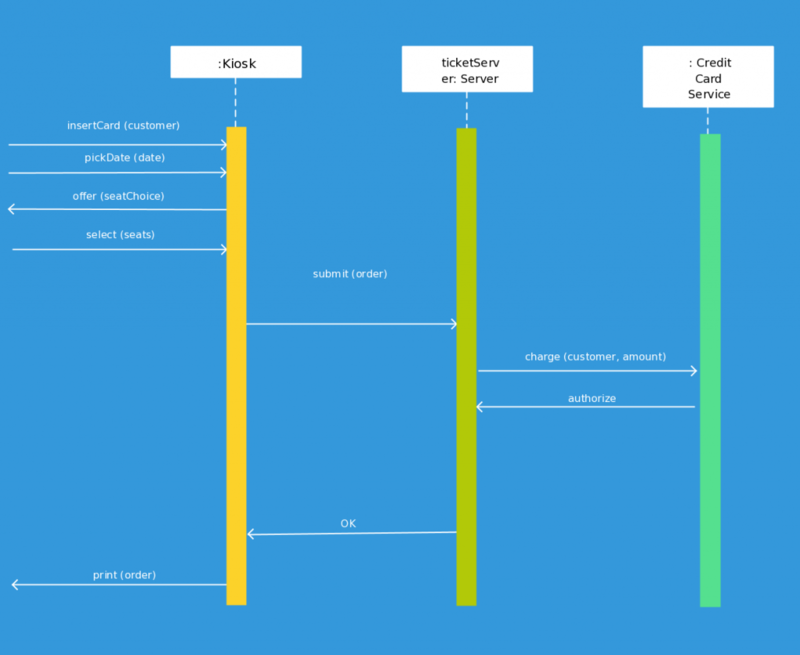 Here is a simple sequence diagram template that shows a balance lookup process of a bank. Using a bit of color in your diagram like the one below is a good way to make it more visually appealing to an audience. Click on the image and make changes using the Creately editor. 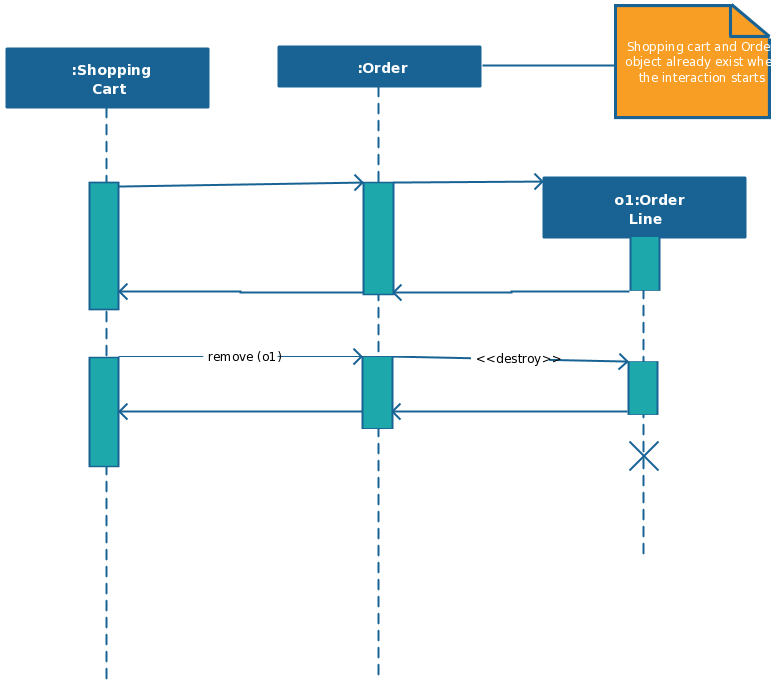 The sequence diagram template below illustrates the interactions that occur between the objects of a ticketing system once a customer places an order for a ticket. The template has used a vibrant color theme for visual appeal; you can select a color them of your own using Creately editor. Just click on the image to modify. The following template is that of a message sequence chart (MSC). 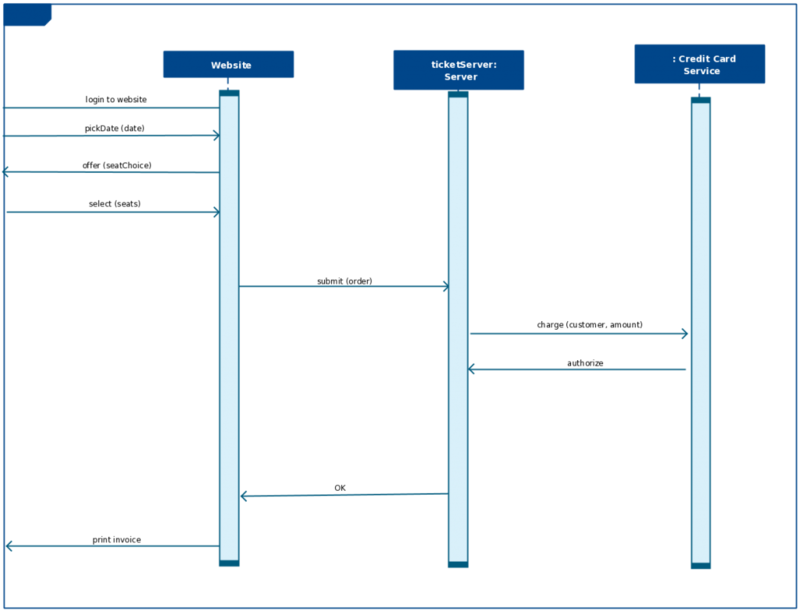 A message sequence chart shows the communication that occurs between the components of a system. Each vertical line here represents a system component and each horizontal arrow represents the messages from one component to the other. Click on the image to edit the diagram according to your needs. A destroy object in a sequence diagram is the X at the bottom of an Activation box. Using a destroy object indicates that the object has been removed from memory, and no other occurrence may occur on the lifeline of the given object once this symbol is used. Click on the image to use this as a template. 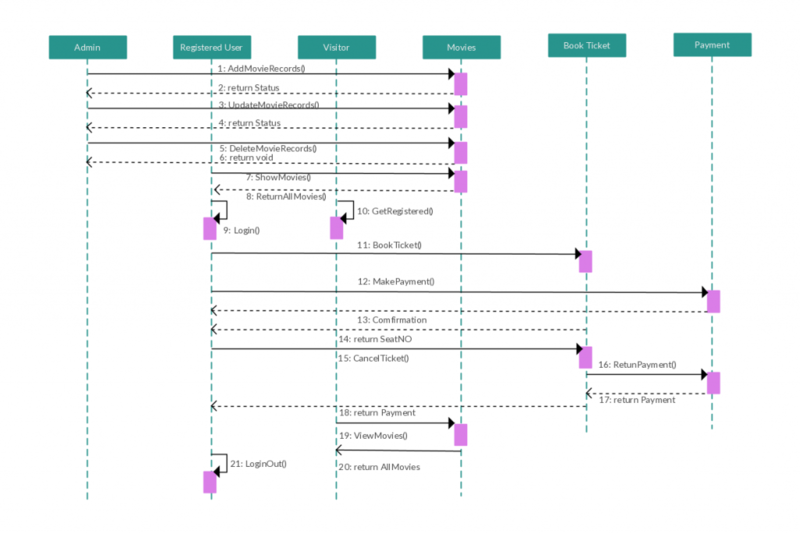 Hope you like our collection of professionally designed sequence diagram templates. You can access more popular sequence diagram examples in our diagramming community or search a particular diagram using a keyword. Also check out this Ultimate Sequence Diagram Tutorial to learn more about sequence diagrams.